KIT includes pattern drawn on quality burlap (bound edges & numbered), ample amount of corresponding wool strips (#6 & #4 cuts), twill binding, and easy to follow instructions. Some smaller kits substitute backing fabric for twill binding. Cozy Mitten Round is a 14" circle which features colorful mittens on a taupe background. Contrasting grays are included for interest. Red plaid inner border adds to the coziness! Bowl of Flowers is available as a KIT or PATTERN ONLY. The rug hooks up to a finished 16" X 18" rectangle. KIT includes a generous amount of color coordinated #6 cut wool strips which corresponds to numbered pattern hand drawn on good quality burlap. Kits also include rug binding and easy to follow instructions. Gray background with contrasting gray tweeds showcases this colorful yet primitive bowl of assorted flowers. Features unique inner scalloped border of soft green. Easter Bunny with Basket of Eggs is available either as a KIT or BURLAP PATTERN. 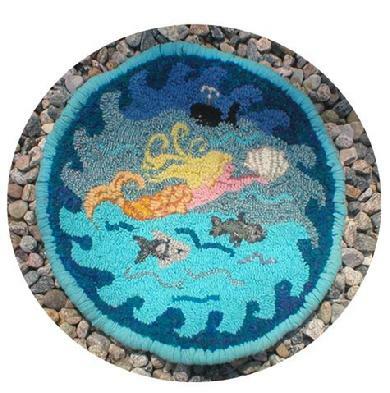 This rug hooks to a finished 14” x 16" oval. KIT includes a generous amount of color coordinated #6 cut wool strips which corresponds to numbered pattern drawn on good quality burlap. Also included are rug binding and easy to follow instructions. WHITE CAT WOOL loves their DOGS, too! This 12" x 17" kit has a barn red house silhouette that prominently features a brown tweed "pooch". Sky is in mottled blues with a yellow sun and a green plaid ground cover. KIT includes a generous amount of color coordinated #6 cut wool strips which corresponds to numbered pattern hand drawn on good quality burlap. Kit also include rug binding and easy to follow instructions. Tell us if you want your DOG a special color....no extra charge! Name your color of DOG! Cape Cod Mermaid is available as a KIT or PATTERN ONLY. The finished chair pad is 14" round. This KIT includes a generous amount of color coordinated #6 cut wool strips which corresponds to numbered pattern hand drawn on good quality burlap. Kits also include rug binding and easy to follow instruction. 3 Primitive Tulips is available as a KIT or PATTERN ONLY. The rug hooks up to a finished 10" X 29" runner. KIT includes a generous amount of color coordinated #6 cut wool strips which corresponds to numbered pattern hand drawn on good quality burlap. Kit also include rug binding and easy to follow instruction. Three primitive tulips in muted shades sit in a background of complimentary grays & taupe wool. Basket of Hydrangea is available as a KIT or PATTERN ONLY. The rug hooks up to a finished 14" round. KIT includes a generous amount of color coordinated #6 cut wool strips which corresponds to numbered pattern hand drawn on good quality burlap. Kits also include rug binding and easy to follow instruction. Striking blues & purple hydrangeas stand out against a black background. Circle basket is brown tweed with a dark brown outline. Daffodils & Tulips in a Basket is available as a KIT or PATTERN ONLY. The rug hooks up to a finished 14" round. Striking Yellow Daffodils, Red & Pinl Tulips stand out against a black background. Circle basket is brown tweed with camel weave & outline. Early Morning Cast is available as a PATTERN ONLY. Our fisherman casts out to a waiting bass who seems VERY interested in the lure! Pattern hand drawn on quality burlap will hook up to an oval rug 26" X 19". Sailing on Cape Cod Bay is available as a KIT or PATTERN ONLY. The chairpad hooks up to a finished 13" round. Multiple tones of blue thoughout make a sriking contrast to the masted sailing ship. Please specify if pattern should read CAPE COD or other up to 10 letters. Lettering strips are #8 cut navy blue wool. Santa comes by Sea is available as a KIT or PATTERN ONLY. The rug hooks up to a finished 19" X 29" oval rug. A detailed Santa comes to Cape Cod on a sea of blues and aqua wool pulled by a black Christmas whale. Brown tweed rope border. This Collection of KITS & PATTERNS of North Atlantic fish found off the shores of Cape Cod is being introduced under the JJ series. All KITS finish off at 11" X 19" and are also available as PATTERN ONLY. Each KIT includes a generous amount of color coordinated #6 cut wool strips which corresponds to numbered pattern hand drawn on good quality burlap. All colors are carefully selected to be complimentary but may differ slightly from the photo. Kits also include rug binding and easy to follow instruction. Primitive Basket of Flowers is available as a KIT or PATTERN ONLY. The rug hooks up to a finished 14" round. Dark brown background highlights primitive sunflower, leaves, and flowers set in a brown tweed basket. Here's some smaller kits that "hook up" fast and make EXCELLENT gifts to keep on hand! They make great hostess gifts, ornaments or special accents for your home. Each BUNNY 6" x 7"
Each HEART 5" x 5 1/2"
Each HOUSE 6" x 5"
Each PUPPY 7" x 5 1/2"
Each XMAS mat 6 1/2" x 7"
All patterns, images & designs are copyrighted by WHITE CAT WOOL. Purchased patterns are for one time use and maybe resold as is or as a finished piece as long as copyright© laws are respected.